I love fresh flowers and would have them in my house every day if I could. 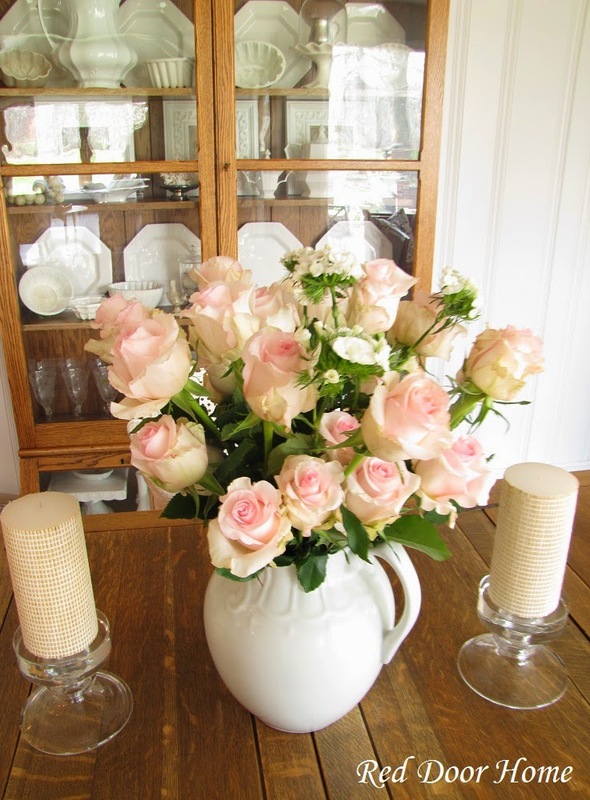 To me, flowers bring life and happiness to a room. There is something about a bouquet of flowers that just makes me smile! Flowers are also my favorite way to let the special people in my life know I am thinking about them. For Christmas each year, my sisters and I send flowers to my mom every month. Of course I like to receive flowers too! So when the people at TheBouqs offered to send flowers for me to review I decided to give them a try. I did a bit of research before saying yes and loved the fact that The Bouqs flowers come from farms that treat the environment and their workers with care and respect. 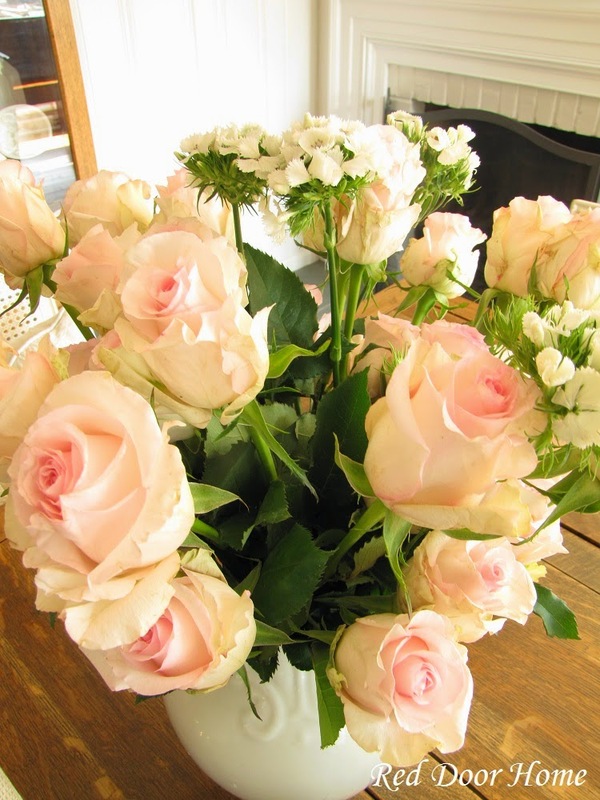 They cut only what they sell and the flowers are shipped directly to you – fresh. Bouquets start at forty dollars but you can double the number of flowers for only ten dollars more. 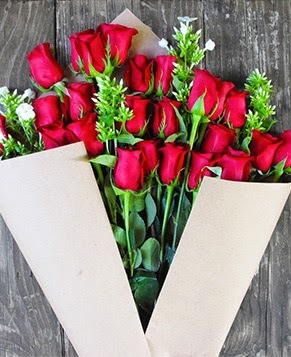 Two dozen roses for fifty dollars – wow! This price also includes shipping to all parts of the United States. A bonus for me was that there are no vases, chocolates, balloons, etc. – simple and straight forward. I placed a double order of the “Above and Beyond” bouquet and received an email confirming my order and another letting me know they were on the way. 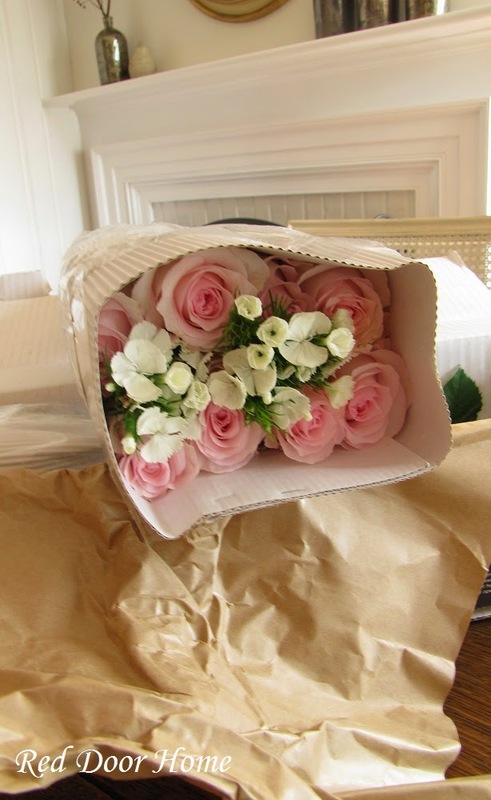 The flowers arrived on time and carefully packaged. The roses were beautiful and just as pictured. They took a day or two to open up but once they did they were stunning. I followed the directions included in the package – using the included cut flower food and changing the water as directed. Over a week after they arrived I still had a lovely bouquet of flowers on my table. Even my husband was impressed! So overall my experience with The Bouqs Company was a positive one. The ordering process was simple and easy, there were no hidden fees or extras, the flowers arrived on time and they were beautiful. So with Mother’s Day just around the corner I now know where I will be purchasing my flowers from. Disclosure: The Bouqs provided the flowers for my review. All opinions are my own and are a reflection of my own personal experience with The Bouq’s company - yours may be different. This post also contains affiliate links which means if you click on them and place an order I will receive a small compensation. I have to admit I had a hard time deciding how to go about sharing the inside of our new house. It has been non-stop work since we moved in nine months ago (we have done a majority of work ourselves) yet we still have years of work ahead. At times I have felt overwhelmed with all that needs to be done, but looking back at where we started makes me realize just how much we have accomplished. So instead of an entire post dedicated to “non-pretty” before pictures, I decided I would share some before and in-progress pictures (since nothing is ever truly finished!) of the rooms we have worked on to date. 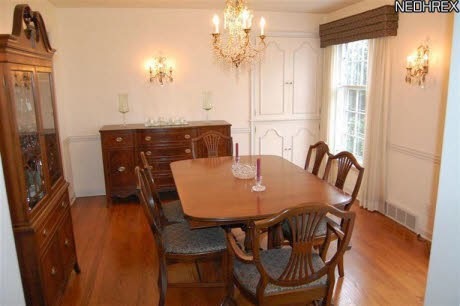 We are lucky in that we were able to use most of the furniture and curtains from our previous house in this house. Some things just did not work and have been placed in the yard sale pile and others ended up in different rooms, but overall I am pleased with how these rooms are coming along. 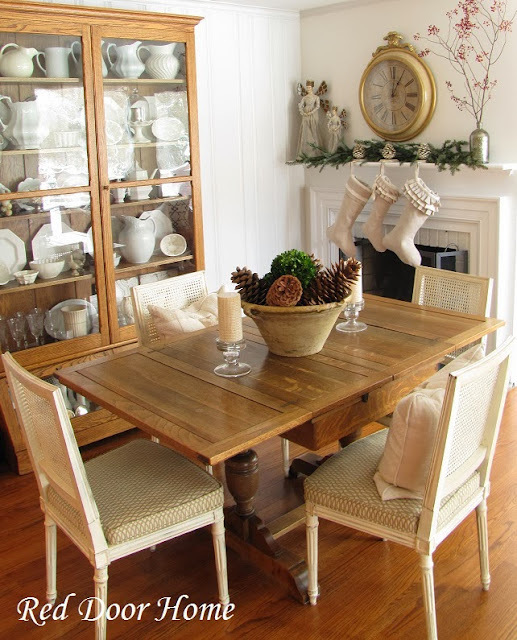 We painted the walls BM White Dove and the built-in china cabinet was painted with Annie Sloan chalk paint. Several of the sconces had to be relocated to different places on the walls to accommodate our furniture and we also switched out the light fixture. 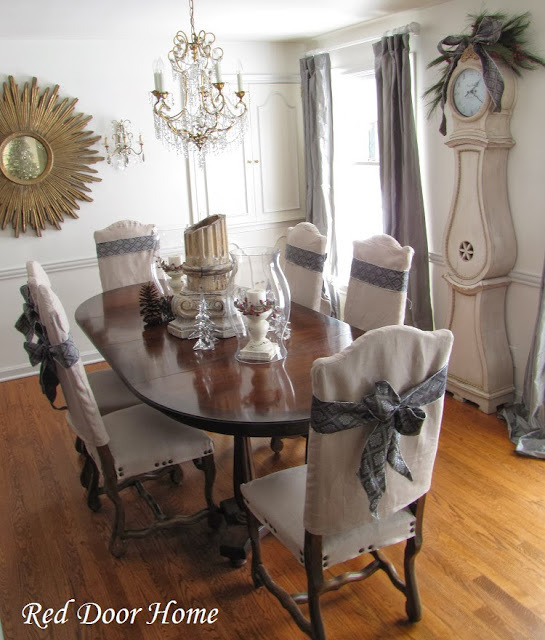 At some point I would like to add crown molding and have glass put in the panels of the top doors of the china cabinet. 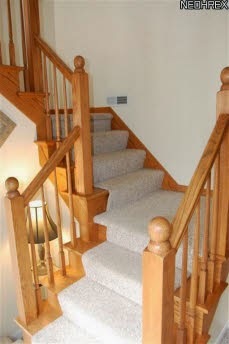 We removed the carpeting and did the best we could to stain the steps to blend in with the original finish. The spindles, risers and trim were painted with a white semi-gloss paint and the walls were painted BM White Dove. A gallery wall of mirrors was also started – hopefully one day the entire wall will be filled with mirrors from floor to ceiling. The wallpaper border was removed and the walls were painted BM White Dove. The biggest change was the floor. We replaced the ceramic tile with slate. The slate continues into the rec room (shown below) as well as a bathroom, the hallway leading to the kitchen and the laundry room. These spaces were a mix of two different types of tile, linoleum and carpet. Changing them to all one material made a huge difference in the flow of the rooms. As I mentioned above, this room received a new slate floor in place of the mix of carpet and tile. We removed the wallpaper border and painted the walls BM White Dove. Hollow stained closet doors and a bathroom door were also replaced with white painted panel doors and new unlacquered brass hardware. So there you have a few of the rooms we have been working on – more to come I promise! There is still much to be done even in all of the above spaces as we still need to paint all the moldings and baseboards, replace the windows and install the quarter round in the rooms with the slate. Then of course there is also the issue of the textured ceilings – ugh! 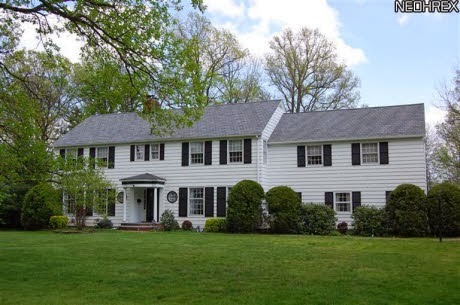 Finally as a side note, I am curious to hear from any of you who have moved to know at what point your “new house” became just “your house.” We have been here for nine months (yes we are still unpacking and organizing!) and I still am calling this our new house. Have a great weekend and a blessed Easter! I finally decided to put the paint brush down long enough to pull together the first of what I hope will be many posts on our new house. We have been here for almost eight months and as you can imagine much has changed since we moved in this past summer. Today I wanted to share pictures of what the outside of the house looked like when we moved in along with a few updates we have completed. We saw lots of potential in this house but knew we were in for many years of updates and changes! 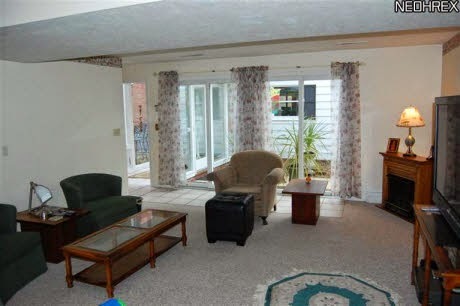 The house is in a great location and has an amazing yard, both front and back. 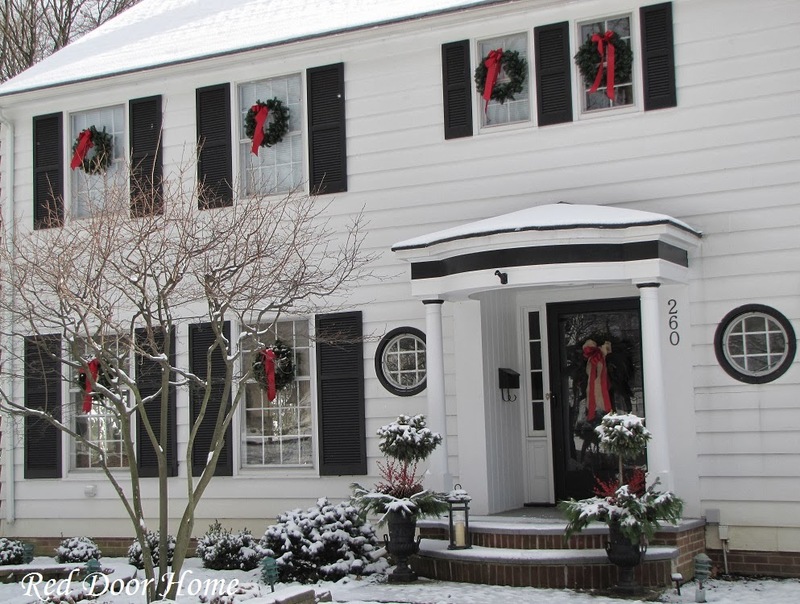 We loved the front yard with its mature trees, brick wall and classic white and black color scheme. Even though we live in town, the yard still feels private and has plenty of room for outside playing and for an eventual garden. It even has a secret courtyard! Now for the dislikes – Besides the obviously way overgrown bushes, the landscaping along the front of the house was also a mess. 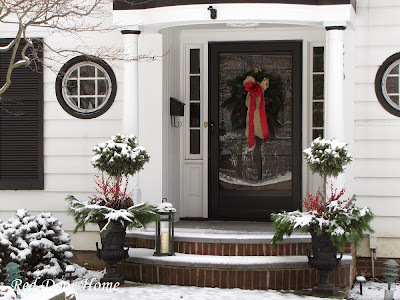 It had ivy and vinca growing up under the clapboards and was a mish-mash of many different varieties of bushes, all lined up in a row and planted way too close to the house – there even was a small maple tree. During the fall we pulled up the ivy, cut down all the large bushes and relocated many of the plantings to other locations on the property. The little maple tree was planted near the lamp post closest to the house and we planted boxwoods on both sides of the front porch. They are a bit small now and hard to see since they are covered in snow. Hopefully they will grow quickly. We have also purchased two new traditional looking white lamp posts and larger lights to replace the ones seen in the photos. They will be installed in the spring once the ground thaws along with a few more bushes. Future plans also include putting a copper roof on the front porch, but that will be a project for a few years from now. 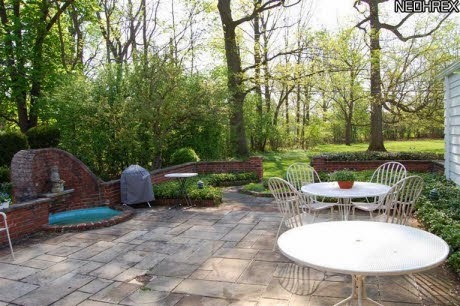 The back yard is also spacious with large trees and a wonderful walled brick patio – it even has a lighted fountain although it currently is not in working order. Mr. RDH thinks we should turn the fountain into a fire pit but I have always wanted a fountain so it is going to be a hard sell to get me to agree! The small gardens surrounding the patio were all completely filled with just pachysandra – except for one lonely hydrangea. 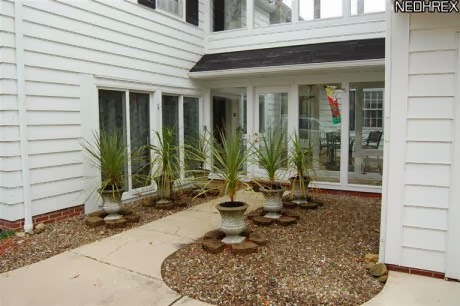 The pachysandra has been entirely removed and transplanted to other areas around the house. 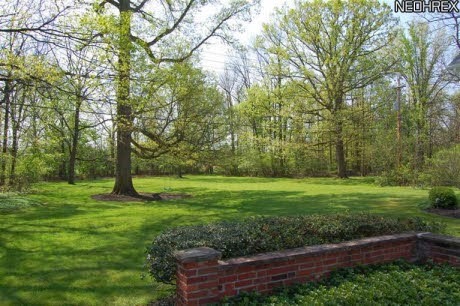 We planted a row of hydrangea bushes along the house (right side in the above picture) and the small lower garden area was planted with a mix of boxwood, peonies and roses. Unfortunately, I did not take photos so I am going to have to wait until the spring to show you what it looks like now. 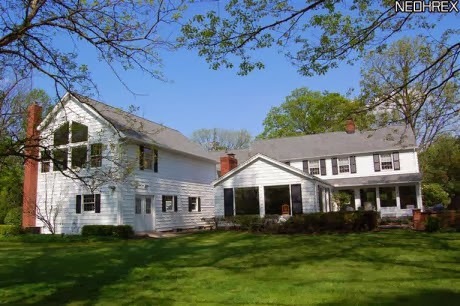 When the previous owners added on a garage and master bedroom suite in the 1990’s, a two story breezeway was constructed to connect the original house to the addition. This created a pretty back entrance as well as a place we are calling our “secret courtyard.” You can see from the picture below, we removed the concrete pots and added boxwood and limelight hydrangeas. I am hopeful they will all survive the winter! 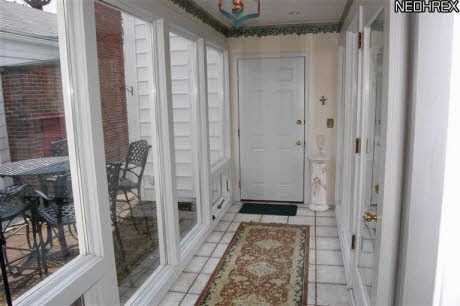 On the back side of the breezeway is our secret courtyard. It is the perfect little spot for a table and chairs. So there you have a brief tour of the outside of our new to us house. I hope to be back soon with some inside pictures. For now though, it is back to painting! Merry Christmas from Our New Home! It has been many months since I have posted on Red Door Home. I could not let the year end without popping in to say thank you! Thank you to everyone who has continued to follow Red Door Home, thank you to everyone who has purchased stockings, tree skirts and more from my Etsy shop (it was a fantastic year!) and thank you to everyone who has left an encouraging comment or two over the past year. This was a blessed year for my entire family and I am truly grateful. Much has happened over the past several months – the biggest of which is we have moved. We listed our house in May, sold our old house and bought a new house within a matter of weeks, and then moved in July – needless to say, it was a very busy summer. Of course the house we purchased needs lots of work and I plan to share pictures after the first of the year of all we have been up too. Until then I have included a few Christmas pictures of our new house to give you a bit of a glimpse into my new surroundings. So thank you again for not giving up on me! I wish you and your family a wonderful holiday season and a happy and healthy new year.